This is the ULTIMATE Pumpkin Cake! 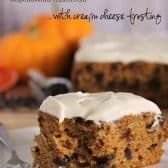 So moist and delicious with my absolute favorite cream cheese frosting! This extra moist pumpkin cake will easily become one of your favorite fall recipes! Preheat oven to 350 degrees. Grease and flour a 9x13 pan. In a large bowl combine flour baking powder, baking soda, cinnamon and pumpkin pie spice. In a separate bowl, combine sugar, oil, vanilla, pumpkin and eggs. Add the pumpkin mixture to the flour mixture and gently stir until combined. Do not overmix. Fold in chocolate chips. Bake 30-35 minutes until a toothpick comes out clean. Cream together cream cheese and butter. Add in powdered sugar a little at a time. Add in vanilla and turn mixer on medium high and mix until light and fluffy!